As we pointed out earlier this year, dad jeans are the latest wave of “normal” dressing to sweep the fashion industry. So what exactly are dad jeans? Think light and loose denim with a very relaxed and ’90s vibe. Still unclear? Don’t sweat it. Today we’re sharing not only where to buy the latest denim trend but also how to style the laid-back jean style. From lightweight dusters and ruffled blouses to an oversize blazer and a simple T-shirt, there’s really no wrong way to style dad jeans. We particularly are into the idea of wearing the style with statement heels and a basic tee for a balanced yet fresh day-to-night look. Ahead you’ll find 10 fresh denim outfit ideas and our favorite selection of dad jeans at the end. 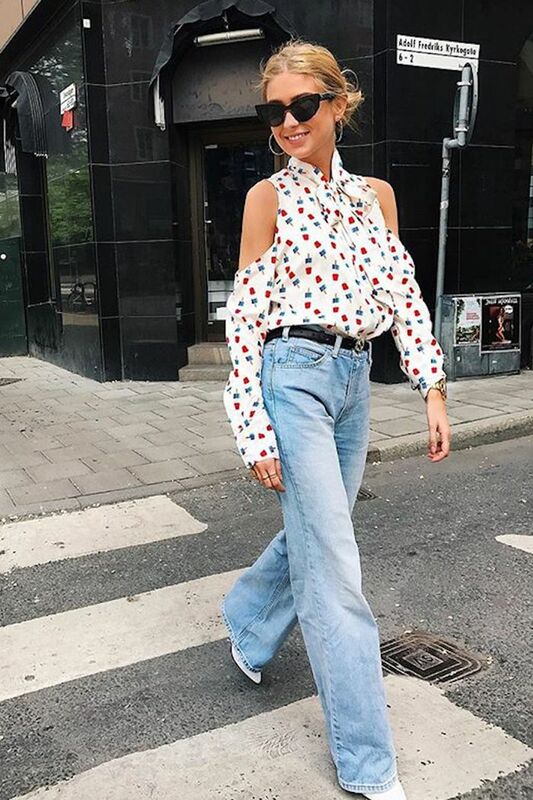 Pair your light-wash jeans with a printed blouse. Add layers and pointed-toe flats for a relaxed yet stylish outfit. You can't go wrong with a cropped printed jacket and matching boots. Yes, white boots are still a must-try for this season. Update an otherwise simple outfit with a statement jacket. An oversize blazer and simple white tee never get old. We love the cropped version of dad jeans here paired with a bright bag. Add a pop of color to your next neutral look by layering with a simple turtleneck. When you pair dad jeans with your dad sneakers. This outfit combination is perfect for running errands this weekend.